Our October report reviewed the limitations of the Phillips Curve in forecasting inflation as it relates to unemployment. Essentially economists interpretation of Phillips posit that lower unemployment equates to higher inflation. This view was created in the 1970’s post Gold/Currency Standard during the inflationary Baby Boom employment surge. Should the overall CPI rise above 4 to 5% or the venerable Core PCE inflation rate relied upon by the Fed rise above 2.5%, then the Fed can justify a faster pace of rate hikes in a quest for a neutral rate of interest called R* where GDP growth and inflation are in equilibrium. When the economy accelerates our central bankers at the Fed use the crutch of the Phillips Curve to make assumptions about inflation and a natural Fed Funds rate. Of course there is nothing natural about it as it’s a construct from the economic tower of Babel. This natural or neutral rate known as R* (neutral interest Rate) was first promulgated by Swedish economist Wicksell of the Austrian School. R* is the magical neutral interest rate where GDP and inflation are stable. Calculating this neutral rate is a chimerical cosmic variance as certain as the perturbations of alternate universes. Leading economists use different metrics and hidden future assumptions in their R* forecasts.Federal Open Market Committee members (FOMC) have submitted their targets for R* at between 2.5% and 3.5% in 2019 . This is not a well defined formula and Chair Powell’s hints that the upper end may be needed has cast a cloud over investors. Non consensus formulas for R* neutral interest rates and vague assumptions of future inflation provide plenty of latitude to pursue higher rates for ulterior motives. Current and former Fed Chairs Powell and Yellen have recently implied that various inflation measures are not that important when they are low, as long as the GDP is above trend and the job market is tight. The Fed controls short term rates and kept it near zero for years while printing Trillions of dollars above trend without a hint of inflation. Now that we finally have signs of lifting all economic boats, the Fed has predetermined they will keep raising rates until they help induce signals of a recession. 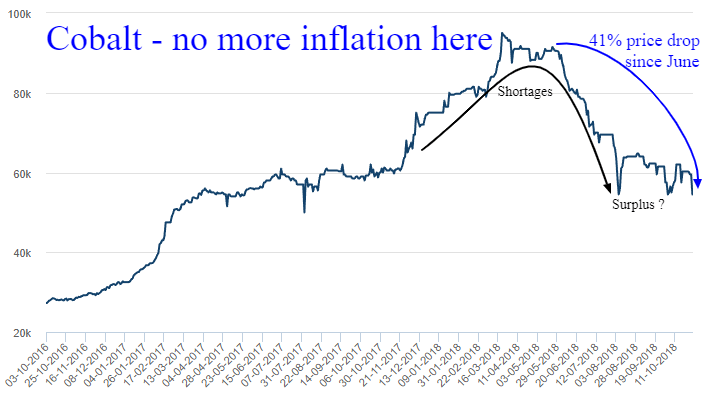 Raising rates and the cost of capital in a strong economy with major shortages of labor and material is understandable. Being inflexible enough to pause when those material prices are falling and inflation proxies are low is myopic. Another misconception by markets and economists pertains to deficits. Trump’s economic adviser Kudlow was interviewed and asked rhetorically about higher deficits causing more inflation, and he correctly disagreed. Can deficits be a factor? Perhaps! Given the history, other factors affecting inflation are more important than debt/GDP and deficits. It’s easy to see here that the only time inflation ran sharply to the upside in the US was during a declining debt to GDP period of the 1970’s. When debt and deficits accelerated seemingly out of control were actually periods when inflation remained amazingly subdued. Another myth exposed! Young Boomers and floating currencies drove inflation higher, while aging Boomers in the US and other Industrialized countries drove inflation rates lower. Deficit spending merely countered potential deflation and learning to live within our means. While the Feds core inflation ignores the more volatile energy factors, industrial metals and energy prices are an indication of economic conditions and current inflation concerns. Lower metals and Oil in recent months along with the very mild 2% core PCE inflation rate all hint that after 8 rate hikes since Trump’s election, it may be time for a pause to assess the winds of global slowing underway. Let’s look at some important proxies of industrial supply and demand which give a perspective on economic winds and ultimately affect inflation. 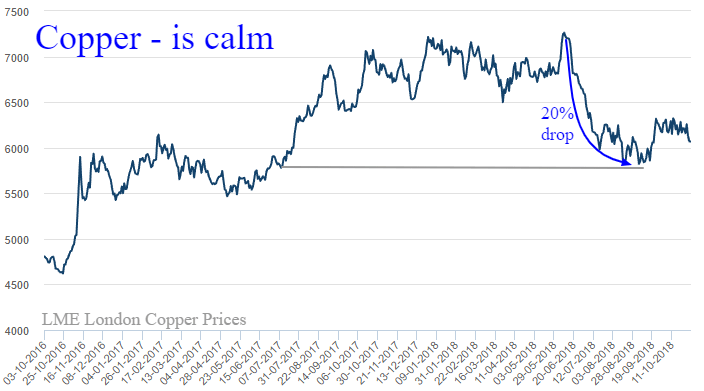 Along with virtually every industrial and precious metal, the sharp decline in recent months of Cobalt, Zinc and Copper reflect improving supply conditions and a cooling global economy. 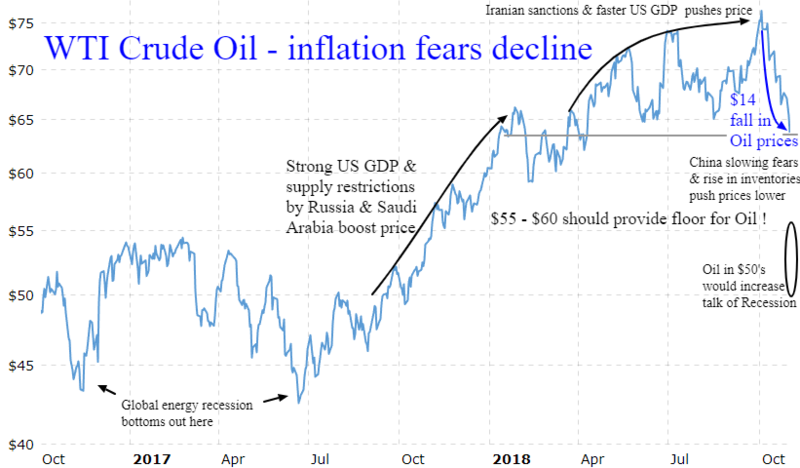 Even Oil has become far less of an inflation risk with potential for more energy deflation should the China trade dispute escalate global slowing fears. Energy and industrial metals are falling from moderate price levels historically and combined with moderate Fed inflation metrics at or below 2% they imply that future Fed rate hikes can wait for signs of renewed upward pricing pressure. The Fed wants to use the excuse of a stronger economy and future inflation potential to reacquire their mostly symbolic recession fighting tools that were lost during the last recession. The Fed has made it clear that any fiscal effort to elevate our GDP growth with tax cuts or other stimulus to a higher new normal >2% will be met with tighter credit, regardless of inflation, to reduce our GDP growth rate. 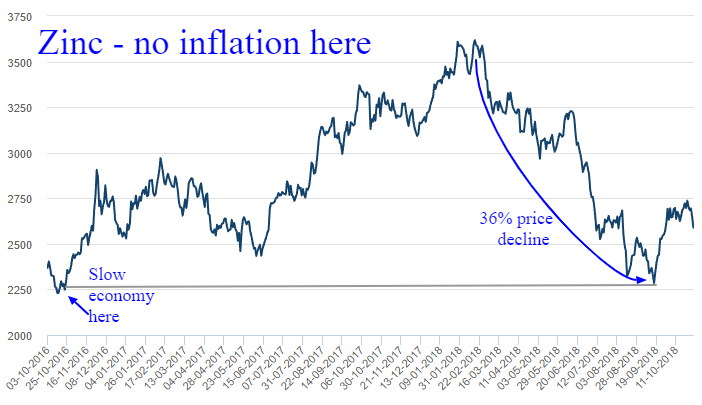 Is the Fed really afraid of inflation? We really don’t think so. The 2.25% Fed Funds rate will be at least 3% by the end of 2019 unless the Fed speeds up out path toward signs of recession first. When the core PCE inflation hits 2.5% or metals and Oil recapture their 2018 price peaks and the elusive China trade deal arrives, then we would endorse reestablishing a steady path to higher rates. 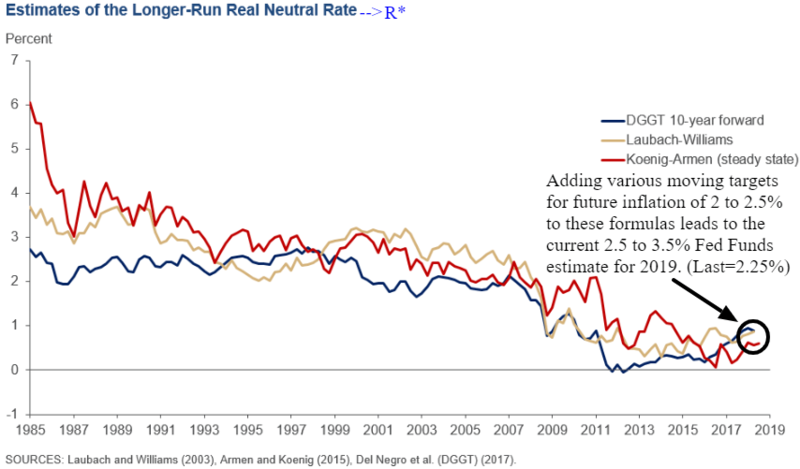 For now the Fed should delink from from the Phillips curve mentality and its use of the nebulous R* neutral interest rate and remain sensitive to the inflation metrics and shifting economic winds.